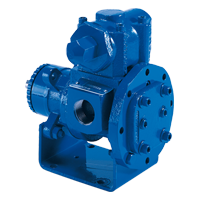 The GHC Series of iron, steel and stainless steel pumps is designed for continuous duty service for applications in the operating ranges shown. These units are available with head jackets for temperature control, carbon graphite bushings for low-viscosity liquids, silicon carbide bushings for wear resistance, and numerous seal options. The GHC Series units may be foot-mounted or, by using a motor adapter, direct connected to NEMA “C” flange motors. This heavy-duty series provides superior rotor shaft support and an integral, maintenance-free radial/thrust bearing for reduced deflection and wear. 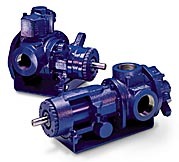 The stub shaft GHS Series Heavy Duty Rotary Gear Pumps and the compact stub shaft GHC Series Heavy Duty Rotary Gear Pumps are available in cast iron, shock-resistant cst steel and corrosion resistant 316 stainless steel to provide superior performance in countless pumping applications. They offer the premium quality features found on all G Series Heavy Duty Gorman Rupp Pumps, as well as performance and serviceability features that are unique to our heavy duty line.